Patagonia's storms are legendary, and climbing there in winter is brutally cold. It's rare for climbers, especially soloists, to visit in the off-season. Marc-Andre Leclerc and Markus Pucher, who previously climbed in Patagonia during peak season, came back looking for a greater challenge. Climbing there this time of year has "more stable weather, but the strong wind remains," frequent (summer) visitor Paul McSorley says. Short days and bitter temperatures make climbing long alpine routes particularly challenging. Though they crossed paths in the town of El Chalten, the men had separate objectives: Pucher attempted Cerro Torre's (3100m) Ragni route (M4 90 degrees, 600m). Leclerc climbed the Rayuela variation to Mastica e Sputa (M5 WI4, 500m) on the South Face of Cerro Pollone (2600m), retreating after reaching the summit ridge, 30 meters below the summit. On September 24, just one day after the Vernal Equinox, Leclerc completed an onsight, free-solo ascent of Aguja Standhardt (2700m) via Tomahawk (Grade 5 C1 WI6, 450m) to Exocet (Grade 5 WI5+, 500m) to reach the summit. Leclerc freed the C1 section of Tomahawk. Pucher's first attempt was at the end of August: "The weather report [called for clear conditions], but unfortunately it was not that way. I spent three days at the base of the wall inside my tent in the snowstorm [worried] that my tent would fly away...and I [would] freeze to death," he tells Alpinist. Over the next two weeks, it snowed and rained. 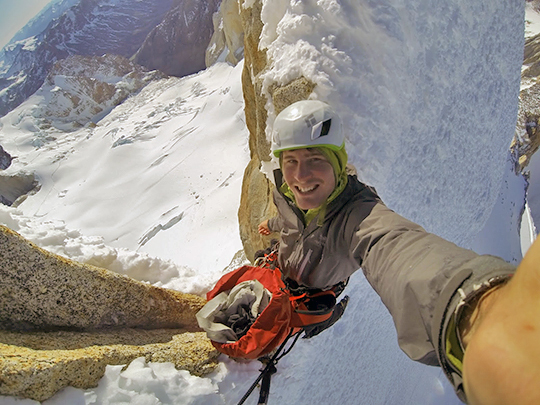 On September 15, Pucher returned to Cerro Torre to make his final attempt for the season. When he arrived at the base, "the wind was so strong that I could no longer stand on my feet. I still do not know exactly how I managed to set up my tent." Two days later at 3 a.m., he set out, climbing partway up Cerro Torre's Ragni route to reach the vicinity of the Helmet (Elmo), which is located before the route's primary difficulties. 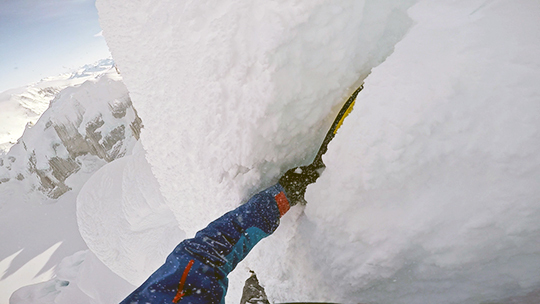 "Suddenly I found myself in a vertical wall of loose, blown-up snow. It took me nearly two hours [to climb] 30 meters. With the knowledge that the weather would be bad...I decided to return to Elmo," he says. Pucher's attempt was made in austral winter, but Leclerc's climbs were completed in spring, as they took place after the last calendar day of winter, September 20. The date of Vernal Equinox is September 23. I crossed the 'schrund under the cover of darkness; I had to make a long exposed traverse above the lip of the 'schrund in order to reach the aesthetic smear of ice that I hoped to climb. I soon reached the long smear of white ice that stretched the whole vertical length of the face, and was delighted to find that the neve was of excellent quality: One swing stick hero Styrofoam at an angle of about 70 degrees for hundreds of meters. High up on the face the ice thinned, and I had to make a series of mixed traverses to reach a parallel ice smear; the perfect quality of the ice, even when only two or three centimeters thick allowed my easy passage, and soon I was at a shelf bisecting the face into two parts. Above, a one-meter-wide strip of ice led for another few pitches to the summit ridge. The climbing was easy, never harder than AI3. As I climbed higher, the face became plastered in rime, obscuring everything, and the ice became harder to follow until I reached the summit ridge. Leclerc tells Alpinist: "I climbed only to the crest where the route ends, my attempt to traverse to the east summit was thwarted by rime over blank slabs. My tools and front points bounced off of rock despite trying several options. I do not think that the route has ever been completed to the summit. I do not know how many parties have actually linked those routes to the summit." Leclerc said about his ascent of Tomahawk to Exocet: "[For] Tomahawk, [I did] a direct start that is basically the same system as the chimney on Exocet. I did not walk up to the Standhardt col, [but] started from much lower down at the base of the East Face." As I started up vertical but blocky mixed terrain, I removed my gloves for a better sense of contact with the rock and my tools. I entered a short offwidth section, heel-toe camming to the best of my ability with crampons on and using my right tool to stick a narrow ice vein in the back of the feature. After [I manteled]... over the top of the block, a series of awkward shimmies across snowed-up flakes brought me to a large wide corner feature. After some more offwidth climbing, facilitated by good holds on the outside edge of the crack, I was able to make a 180-degree spin and exit onto the left-hand wall via a series of gritty ice-filled cracks, using both my hands and dry-tooling techniques. At times I found myself palming the left-hand wall and walking my feet up the ice on the opposite side of the chimney, using only my right tool in the ice. Drop knees and stemming between holds on the chimney's sidewalls also came in handy. I topped out onto the summit slopes and was rewarded with an incredible view out over the icecap, a view that melts my mind each and every time I see it. A light wind sweeping over the ridge and some clouds in the sky prompted me to move quickly in case the weather was about to change, and I scampered over to the base of the beautiful rime mushroom that forms the summit. Here I saw that a small tunnel through the rime would provide passage onto the summit, but the tunnel was so narrow that my shoulders barely fit inside. I found myself unable to swing my tools or kick with my boots, so I resorted to some kind of 'rodent' technique. Similar to a squeeze chimney in rock, but distinctively more 'rat like' with plenty of snow and rime falling in my face to complete the cartoon-like image. After three or four difficult meters I arrived onto the summit of Aguja Standhardt, somewhat surprised to be there after having started the climb hours before with zero expectation of what I may encounter. I checked the time, 4:30 p.m., exactly 12 hours after leaving Niponino. 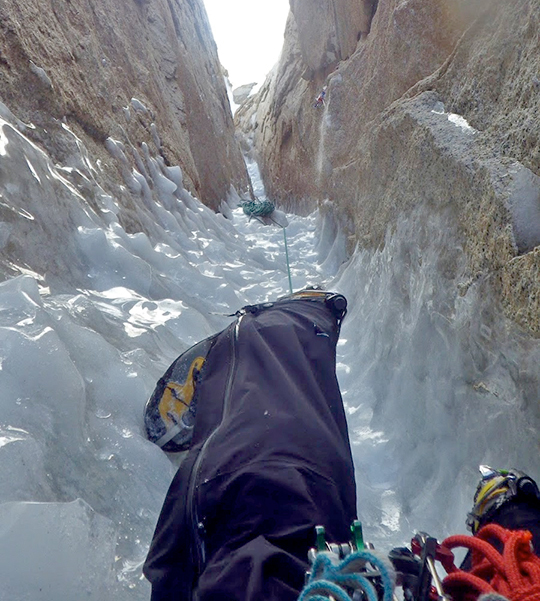 Both climbers had previously soloed Cerro Torre in summer. "I already know that I'll come back again, back to Patagonia, back to Cerro Torre in winter," Pucher says. "Regarding Marc-Andre, I believe he is playing in a league of his own," Rolando Garibotti says. "I am not sure there are any other climbers around that have the skills to tackle such difficult climbs free solo, or with so little belay." Cerro Torre has seen very few winter ascents. In 1985 Paolo Caruso, Maurizio Giarolli, Ermanno Salvaterra and Andrea Sarchi did the first winter ascent via the Compressor Route. In July 1999, Thomas Ulrich, Stephan Siegrist, David Fasel and Gregory Crouch reached the summit plateau via the Ragni route, at the base of a six-meter-tall summit mushroom. Siegrist returned in 2013, again via the Ragni route, reaching the summit with Dani Arnold, Thomas Huber and Matias Villavicencio. Tommy Bonapace and Toni Ponholzer completed the first winter ascent of Aguja Standhardt, via Exocet on September 2, 1990, Bonapace states in the 1992 American Alpine Journal. 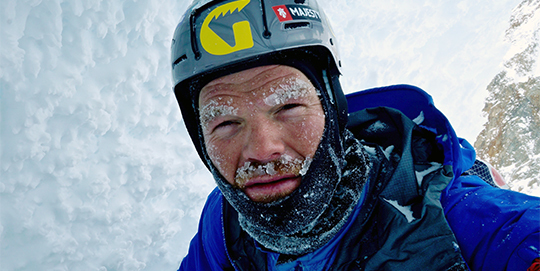 Martin Boiteau and Claude-Andre Nadon completed a winter ascent of Tomahawk in 2002, reports Garibotti on his website pataclimb.com. Andy Kirkpatrick has visited Argentine Patagonia four times in winter. Over the years, and partnered with others, he climbed Vol de Nuit (M6 A1 90 degrees, 450m) to the summit ridge on Aguja Mermoz, plus the first winter ascent of Aguja Poincenot (3002m) and Aguja Guillaumet (2580m). He almost got to the top of the Supercanaleta (Grade 5 80 degrees, 1600m). He also attempted Aguja Standhardt and Cerro Torre. "When we went there in 1998, everything was closed and we were unsure if we could even get to El Chalten, but now with the new road there's tons of people every day coming in, so all the hostels are open," Kirkpatrick says. "Nevertheless I think the routes in the massif are seen as being major alpine challenges in the summer, and doubly so in the winter." Kirkpatrick, Ian Parnell and Alastair Lee made a documentary by Posing Productions about climbing in the area during the coldest time of the year called "Patagonian Winter."